As the narrator attempts to sort out what happened in King's life--paying visits to his devoted mother, his estranged young daughter and her mother, his girlfriend, his brother, and his cousin--the writer's own sense of identity begins to feel more and more like a fiction. He is one of the "free people" while Kendrick, who studies theology and philosophy, will never get his only wish, expressed plainly as "I just need to get out of here." The dichotomy between their lives forces the narrator to confront the violence in his own past, and also to reexamine American notions of guilt and penance, racial bias, and the inherent perversity of punitive justice. It is common knowledge that we have an incarceration crisis in our country. 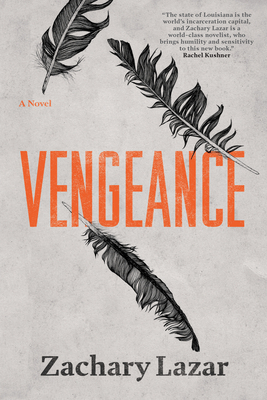 Vengeance, by way of vivid storytelling, helps us to understand the failure of empathy and imagination that causes it. Zachary Lazar is the author of four previous books, including the novel Sway, the memoir Evening's Empire: The Story of My Father's Murder, and the novel I Pity the Poor Immigrant, a New York Times Notable Book of 2014. His honors include a Guggenheim Fellowship, a Hodder Fellowship from Princeton University, and the 2015 John Updike Award from the American Academy of Arts and Letters for "a writer in mid-career whose work has demonstrated consistent excellence." Lazar's journalism has appeared in The New York Times, NPR's All Things Considered, the Los Angeles Times, and elsewhere. He lives in New Orleans, where he is on the creative writing faculty at Tulane University.